Philippa Johnson-Dwyer hails from South Africa; James Dwyer is from Ireland. She rides with one arm as the result of a car accident. James is quite recognizable for riding with one leg that was amputated due to cancer. They compete against each other in Grade IV para-dressage at the international level and that’s how they met crossing paths and yes, literally, bumping into each other in various warm up rings. James remembers distinctly that it was in Moorsele, Belgium in 2002 when he tried to catch her eye. "I thought oh, what a nice gent but I also thought mistakenly that he was married," recalls Philippa. “For eight years, I believed he was married,” she says laughing. The couple have traveled remarkably parallel routes, albeit in different directions, crisscrossing the globe to reach heights as medalists in international competition. Now together, their mutual admiration, respect, budding optimism and ready humor creates a most natural fit. "We were always friends and competitors,"
says Philippa Johnson-Dwyer meeting James after his ride. In 1998, a traumatic car accident left Philippa’s right arm nearly useless and her right leg with 60% strength. After a tough year of rehabilitation and relearning to ride, she started competing again. Before the accident, she competed in able-bodied dressage competitions at the national level. However, before her second competition she tried to mount her horse without help, lost her balance and fell, breaking her back. RSA at the 2014 Alltech FEI World Equestrian Games. Against doctor’s orders, she chose to follow her horse passion and ride again. 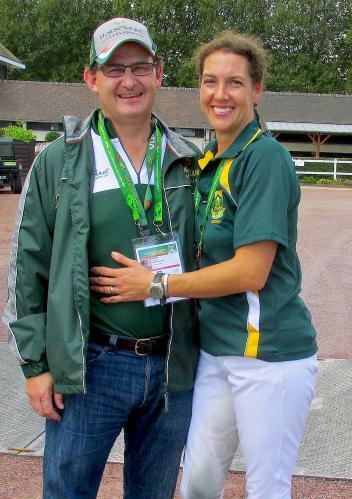 She competed in her first para-equestrian competition with the South African team in 2002 with the help of her South African coach, Katrine Puttick, who helped her during the whole process. Daughter of a showjumping rider, Phillipa had grown up riding but she traveled to Belgium to find a dressage horse having only known thoroughbreds in Johannesburg. Under Apartheid, the supply of horses was strictly limited to native bred horses, mainly, thoroughbreds. “I first saw warmbloods on TV,” she recalls. “They were like dream horses, their movement! But the first one I sat on was so heavy, bulky and strong. I thought, I’ll never ride this.” She despaired until one of the trainers who had watched her ride introduced her to Burgman’s Benedict who became her instant partner and soulmate. Philippa bought the 9-year-old Hannovarian gelding by Borneo with the help of Rutger van Werkhoven, packed her bags and moved to Belgium to immerse herself in European dressage study and tradition. From 2003 on, under the guidance of trainer Chris Haazen, Philippa and Benedict prepared for the 2004 Paralympics in Athens with the goal to place in top five. Surpassing expectations, they wore silver twice and made history as the first equestrian medals ever won by South Africa. Four years later, the trio of Haazen, Benedict and Philippa soared to gold at the 2008 Paralympics in Hong Kong. Also, notable as the first time that South Africa had sent a complete equestrian team to the Paralympics. Philippa’s mantra: "Don't allow anyone to put limits on your dreams." “My dad always had horses, ponies at home, so I started at an early age. We all rode. We went to the gymkhanas and used to showjump quite a lot.” says James of his childhood in Co. Kilkenny but at 16 years old, James was diagnosed with bone cancer. Doctors removed bone from his leg, added an artificial knee and a bar going down to his ankle. Doctors also warned him not to ride. For 10 years, James struggled with pain and infections. He finally had the leg amputated in 1997. “That was probably the best day of my life,” he says. “I wasn’t expecting to feel that way but when I woke up from the anesthetic, I felt so good.” Working as a bank teller, and despite having a quarter of a lung removed due to a secondary cancer, Dwyer started looking at horses again and wondering. While so many riders see Europe as the Holy Grail of training, James headed in the opposite direction. 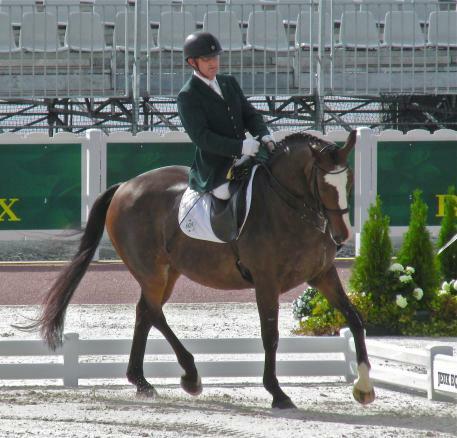 In 2001, he relocated to America with the blessing of his Irish coach, Donie McNamara to further his dressage education. His brother, showjumper Patrick Dwyer, who worked with Kevin Babington in PA, got in touch with eventer Missy Ransehousen through a mutual friend. James admits he didn’t even know who Jessica Ransehousen, a three-time Olympian, was when he first arrived. He signed on as a working student and farmhand in exchange for lessons. “I'm very lucky," he says, about Missy Ransehousen who had just become the coach of the U.S. Paralympic team and the program at Blue Hill Farm in PA. "It worked out very well." He also experimented with how best to use what he had, core strength and his seat over riding with an artificial leg. "There was too much pressure on the horse's side because I could never take it (the leg) away, so we decided to try it without the leg. My riding improved a lot," said Dwyer, who wears a prosthesis for walking. In 2006, Missy helped James look for a suitable dressage mount. In Holland, they found Orlando, a 1996 KWPN by Hamlet. “He seemed to be a very willing horse. One of my major difficulties would be a half-pass to the left because I don’t have that leg. When I rode him and asked him to half-pass, he just went ahead and did it. Even at that stage he was willing.” With his handsome wide blazed forehead, Orlando or Ben, would become James‘ other half. Together, they cemented a winning, consistent partnership, ticking off milestone after milestone. 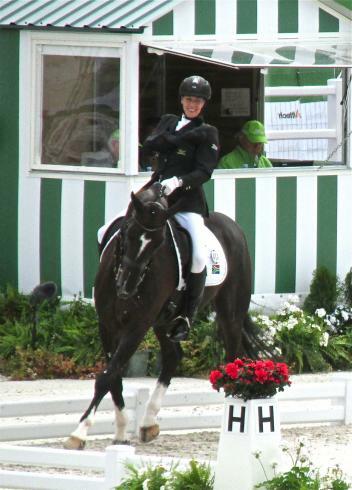 By 2008, Dwyer was competing Prix St. George tests to Intermediate I level and in 2010, became the first rider ever to represent Ireland at a World Equestrian Games (WEG) in Kentucky where para-equestrian debuted, finishing 5th in Grade IV. 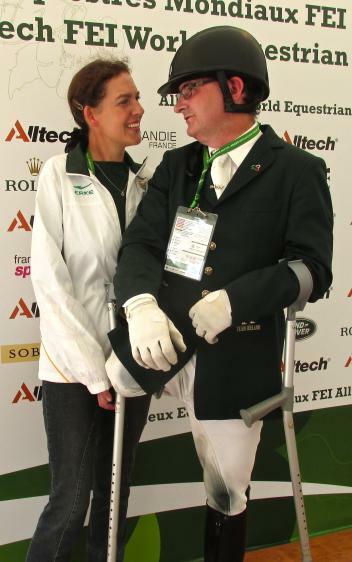 Finally, he achieved his long sought goal of riding for Ireland at the 2012 Paralympic Games in London where against more favored, long established teams, they earned the Bronze team medal. In Feb 2013, he moved back to Europe, where he and Philippa both now train with Chris Haazen in Belgium. Last fall, he fell off his younger horse and fractured two vertebrae. As he took three months off to heal, there wasn’t enough time to prepare the younger horse for the upcoming WEG, so he brought his trusted friend, Orlando, to the Alltech FEI World Equestrian Games 2014 in Normandy, who performed regally and steadfast as ever. at the 2014 Alltech FEI World Equestrian Games. In January 2014, James and Philippa were married in Cape Town. They continue to compete in the Grade IV para divisions while also showing in national able-bodied competitions at the Prix St. George level and higher. Supportive of each other's careers and ambitions. Facing off against each other in Normandy, James topped Philippa’s score on the team test but roles reversed in the individual test. Both hoped to qualify for the freestyle but Phillpa made the cut with her newer partner Verdi, a 2002 KWPN Warmblood by Osmium (by Ferro). Benedict is retired from competition but he’s still ridden nearly everyday. She says they do have interesting anatomical debates about which is more difficult, riding with one leg or one arm. Both thinks the other has it tougher. Philippa notes that her uneven leg function creates more a difficult aid situation than even her one arm for the horse. She quotes German event rider Michael Jung saying, "A horse without a rider is still a horse but a rider without horse is nothing." For para riders, this holds an even more potent meaning. Together, the Dwyers are looking to open a training center in Belgium as a central location for both para and able-bodied riders with the aim of helping developing nations like Philippa’s homeland of South Africa to navigate the often hard to decipher rules and paperwork required to work and compete in Europe. Other shared goals are to ride at the Grand Prix level in Europe with an eye to the 2016 Paralympic Games in Rio de Janeiro. James’ easy going Irish charm aligns perfectly with Philippa’s equally laid back but bubbly exuberance. Sharing their love and life with horses and each other is both a fairytale ending and a beginning.